As I notice a lively discussion in cyberspace whether we are in an inflationary or deflationary period here is a preview of how "rich" everybody was in the Great German depression 1922/23. These 2 banknotes should sober up everybody. 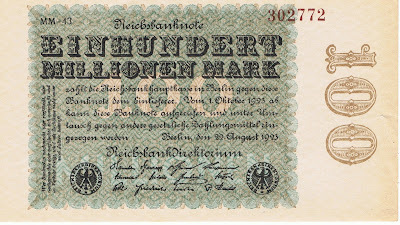 At the beginning of the Germany's monetary downfall one Federal Reserve Note was worth 4 Reichsmark. 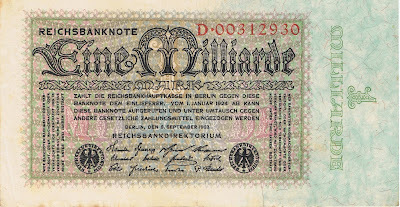 Only 2 years later one FRN was worth 4.2 billion Reichsmark. So much about the stability of unbacked currencies. This may also be a reason why especially Germans but also many other Europeans fear nothing more than inflation that ultimately destroys their savings. 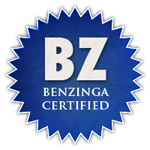 The 2 banknotes have some collector's value that exceeds their past purchasing power. I bought both banknotes via ebay and paid around €12 for both of them. "Eine Milliarde" is one billion, or about a loaf of bread then.